33102 has safely arrived for her Welsh holiday at the Llangollen Railway and is seen at Berwyn on Tuesday evening during a successful light engine test and crew training run. The Saturday PLEG/BLS charter for the 12:15 shunter shuttle on Saturday 29th September has sold out. We hope to have a list at the ticket office/shop where those wanting a shunter ride on the other two Saturday trips (and all 3 on Sunday) can reserve their place as they purchase their ticket. We appreciate this is likely to end up with folk being disappointed so our apologies that capacity is limited. Unfortunately 1566 remains unfit. We have fitted 12 refurbished injectors (done last week by Colchester Diesels), changed the fuel filters and fuel pump and gear but can still only get 6 cylinders firing (3 on each bank). We’re at a bit of a loss as to what’s left to fettle – thanks to those who are already providing technical advice, but if anyone has any suggestions we’re all ears. 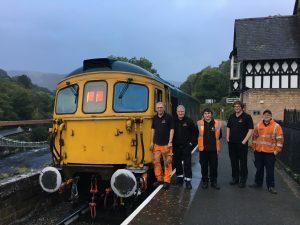 In the event that 1566 isn’t fit, the times of workings won’t change but locos will stay with their diagrams and workings back from Corwen will be a controlled propel, as per normal current working arrangements until the run-round loop and station at Corwen Central is commissioned some time next year.